Canon announced the EOS Rebel T6 camera today. Sample photos taken with the camera can be seen on Canon Japan's website. The article below from Canon Digital Learning Center points out the advantages of a DSLR vs Smartphone in taking photos. Frankly, it is obvious to a thinking person that a smartphone or mirrorless camera is unlikely to replace a DSLR body for most photographers in the foreseeable future. But what camera manufacturers have to contend with is the smartphone's versatility and customers' willingness to compromise on photo quality to gain the extra convenience of carrying an all-in-one gadget. It’s entirely true that many casual amateurs and even a few experienced photographers regularly shoot pictures with their smartphones, because they’re handy, and the images are “good enough.” For some, they’ll never feel the need to move past the imaging threshold of shooting selfies to post on social media sites. But even the most casual of these users knows in his or her heart that the photographic world extends far beyond what’s possible with a smartphone. And some of these users are ready to make that move to their first interchangeable lens SLR, knowing that the investment will reward them with superior images, and lifelong potential with interchangeable lens access. Canon’s EOS Rebel models are the point of entry for many of these new users, and Canon’s latest Rebel entry — the EOS Rebel T6 — is perhaps better-suited for these users than any previous Rebel models. What does stepping-up to a digital SLR bring me that I can’t get with a smartphone? The 18 million pixel CMOS sensor in the EOS Rebel T6 is about 25 times the size* of the sensor in many smartphones. You may look at a smartphone’s specs and see pixel resolution numbers approaching or even exceeding the Rebel T6’s 18 million pixels. But with each pixel much larger than a smartphone’s, the digital SLR’s light gathering capability, and ability to record good detail in bright areas and shadows, are absolutely better. Two Rebel T6 capabilities on display here : its ability to record excellent detail in low light (ISO 6400 in this shot), and the ultra wide-angle capability offered by the accessory EF-S 10-18mm STM lens. Fine detail, as well as texture and detail in bright highlights and dark shadows, are some of the areas where stepping-up to a digital SLR will “raise your game” compared to what’s possible with today’s smartphones. Not every picture the casual shooter takes is in daylight, or with flash. The ability to record great images in low-light, without flash, is where the digital SLR truly shows the benefits of that large imaging sensor. This can be true whether the image is a darkened city street scene, or action shots at an indoor sporting event. This is an enormous area of potential that’s opened up when users turn to a digital SLR camera. As compact and convenient as smartphones are, their lenses usually are fixed at a semi wide-angle setting (OK for small groups of people, much less than OK when you want to zero-in on a distant subject). No “digital zooming” is required with an EOS Rebel T6 to bring in more distant subjects, or to take powerful images of your kids playing sports. The Rebel T6 offers full access to Canon’s EF and EF-S lens system — the world’s largest, with over 70 interchangeable lens choices. There’s no comparison: when you want to get in close, a digital SLR’s telephoto options make it far easier to get the shot you want. Here, you can see the differences in a shot taken with a popular smartphone, vs. a Rebel T6 shot, in Sports Mode, using a zoom lens at a modest 110mm telephoto setting. Compare the two shots below — one taken with the Rebel T6 at 50mm (right), with the lens at f/4, and the other with a popular smartphone at its semi wide-angle setting (left). The slight tele perspective and blurred background in the Rebel T6 shot combine for a pleasant portrait, while the smartphone image really looks like a snapshot. And it’s no accident that the skin tones in the DSLR shot, as well as the rendering of shadows, are markedly superior to what a smartphone can produce. The EOS Rebel T6 has virtually all the same shooting modes and features as Canon’s sophisticated, high-end DSLRs. So while first-time users will frequently use the camera in the full-auto “green zone” mode, it’s easy to dial in the shooting control and even picture effects you want… without having to download and access separate “apps.” Any form of operation from fully automatic to complete manual control is right on the camera’s Mode Dial. If you, or someone you know, enjoys shooting pictures, these features and their imaging potential are strong reasons to consider stepping up from a smartphone and moving into a digital SLR. When you want to start making your own photographic settings, it’s easy with a digital SLR. Here, the Rebel T6 and its AF system, an optional accessory EF-S 55-250mm STM zoom lens, combined with a fast 1/4000th second shutter speed, produced a dramatic action image. The EOS Rebel T6 can shoot continuously at up to 3 frames per second, at full resolution. Where does the new EOS Rebel T6 stand in the Rebel series? Highest-spec (and most expensive) model in EOS Rebel line; 24MP sensor; high-end features including Quick Control Dial on back for direct exposure inputs; advanced 19-point AF system; fast 5 fps shooting; advanced Hybrid CMOS AF III during Live View and video shooting; continuous Servo AF during Live View shooting; Wi-Fi (and NFC) built-in. Less-expensive version of high-end T6s… same 24MP sensor and 19-point AF; same 5 fps shooting speed; standard 4 Control Key buttons instead of Quick Control Dial on back; no Servo AF during Live View shooting; Wi-Fi and NFC built-in. Super-compact Rebel model; 18MP resolution; up to 4 fps shooting speed; traditional 4-way controller on rear of camera; Hybrid CMOS AF II for AF during Live View and video recording; No built-in Wi-Fi. Incredibly compact size is major selling point of this model. Newly-introduced in Spring of 2016 — most affordable Rebel model. 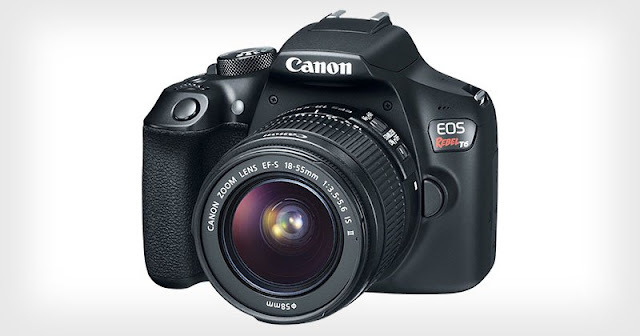 Replaces EOS Rebel T5, which was by far Canon’s most popular EOS camera. 18MP resolution; up to 3 fps shooting speed; 9-point AF when shooting still images through eye-level viewfinder; traditional contrast-type AF off image sensor during Live View and video shooting; Video up to Full HD (1080p) at 30 fps; Built-in Wi-Fi with NFC. So don’t be confused by the proliferation of “T6” models in the Canon EOS Rebel line… if there’s a letter following the T6 moniker, it signifies a more advanced camera, with the “S” model at the top of the Rebel line, as of early 2016. The new EOS Rebel T6 — sans extra letters — is the affordable point of entry for the vast majority of new digital SLR customers considering Canon. This is going to be huge for many of today’s amateur photographers, who want the immediacy of being able to shoot pictures, and be able to send and share them within moments of taking them. The EOS Rebel T6 brings Wi-Fi to these customers, with some powerful built-in capabilities. And to be clear: Wi-Fi connection doesn't require any type of Wi-Fi accessories, transmitters, and so on… it’s all built-in. Whether they’re images we take in our backyard, or halfway around the world, today’s amateur shooters want to be able to share them quickly with family, friends, or even clients. What separates a digital SLR like the Rebel T6 from a typical smartphone is the tremendous photographic potential, such as in this shot, taken with the accessory, ultra-wide EF-S 10-18mm STM lens. With the Rebel T6’s built-in Wi-Fi, you can take a picture like this, and immediately send it to your phone, even if you’re miles away from a normal wireless internet connection. Using the phone, you can then share a high-quality image via e-mail, or to social media sites. It’s certainly true that users today can shoot pictures with their smartphones, and send them immediately via e-mail, or upload them to social media sites. Here’s the difference: EOS Rebel T6 users can now do similar things, but with far more imaging potential. Think of the two portrait images (on page 1), comparing a Rebel T6 shot with a smartphone picture. Which would you rather post to your social media page? This is the potential that even the most casual amateurs can unlock with the Rebel T6 camera. Lets you easily and quickly view your camera’s images on your smartphone’s screen; select any images you want and upload them to the phone; and from the phone, easily send images to anyone you want via your phone’s e-mail, or upload to social media sites. You can even remote-control the camera from your phone or tablet! Wi-Fi connection of camera to smartphone can be done without any external internet connection active. If you have access to a standard wireless internet system, such as in a home or workplace, you can connect the camera to that wireless internet network, and from there, select and upload images to Canon’s cloud-based Canon Image Gateway. Pre-set groups of e-mail contacts or direct links to your Facebook™ or other social media sites, and then (via Canon Image Gateway) share images directly to those groups or sites. This optional device may be the perfect organization tool for the average amateur photographer. Canon’s Connect Station CS100 is a stand-alone device that can store about 150,000 full-resolution, best-quality JPEG images from the Rebel T6 (or about 70 hours of Full HD video footage). And, the Rebel T6 can connect and download original image files to the CS100 wirelessly — simply touching the T6 to the CS100 allows immediate connection and downloading of files from camera to the Connect Station. Once images are copied to the CS100, they can be easily viewed on a compatible HDTV, using wireless connectivity. The introduction of the EOS Rebel T6 brings a very full digital SLR feature set to a broad audience, and specifically targets those customers new to digital SLR photography. For anyone who’s been shooting with a smartphone and contemplating taking that step into an interchangeable lens SLR, the Rebel T6 represents an inviting step forward. It offers a full range of shooting modes, from totally automatic operation to traditional modes like shutter priority, aperture priority, and full manual exposure control. It can focus continuously on moving subjects, with its standard 9-point AF system, and shoot at up to 3 fps. RAW or JPEG still images can be taken (or both! ), and video recording up to Full HD (1080p) at 30 fps is possible, too. And perhaps most important, this camera truly is a gateway into the world of digital SLR photography. It doesn’t end with the standard lens that comes with the camera… any lens in the Canon EOS system can be used on the Rebel T6. It’s compatible with Canon’s full line of EX-series speedlites. Remote control can be done through your smartphone via a Wi-Fi connection (as mentioned above), or through an accessory Canon RS-60E3 wired remote controller. In a simple, easy-to-operate package, the Rebel T6 represents a terrific starting point to begin one’s journey into digital SLR photography. If you’re an entry-level shooter who’s been thinking about investing in a great camera system, this may be the right answer for you. And if you’re a seasoned DSLR veteran, this may be the camera to refer your friends and colleagues to, if and when they come to you asking for advice on a good starting interchangeable lens camera.